Whoopi Goldberg, who plays casework supervisor Janette Grayson, makes a powerful witness stand speech on the failure of society to protect children. Screen capture courtesy of Law and Order: Special Victims Unit. Social workers alerted SocialWorkersSpeak.org to watch the Oct. 7 episode of NBC’s “Law and Order: Special Victims Unit” that deals with the impossibly high caseloads of Child Protection Services workers and how they often take the blame when guardians hurt or kill a child. In the episode”Institutional Fail” a hungry boy named Bruno leaves his cluttered New York City apartment to get food at a corner store. Police search the apartment to locate his missing mother but instead find his sister Keisha locked in a dog kennel, beaten and starved. Keisha dies from her injuries and malnutrition the next day. Instead of just going after Keisha’s mother, who is addicted to drugs and admits she abused her daughter, authorities file charges against caseworker Keith Musio (actor John Magaro) and his supervisor Janette Grayson, played by comedian, TV talk show host and Oscar Award-winning actor Whoopi Goldberg. Police discover Grayson and higher ups had pressured Musio and others to falsify home visit reports to keep up with quotas. They had not visited Keisha’s household in months. On the witness stand Janette Grayson has a mental breakdown. In a powerful speech she condemns police, the courts and society for using caseworkers as scapegoats while not addressing larger societal problems such as poverty, drug addiction and crime that lead to child abuse and neglect. National Association of Social Workers member Sharon Sterling, LCSW, in Arizona was impressed by the episode. The episode is available on Hulu.com and video-on-demand from your local cable provider. This episode made me very angry. I have had positive experiences working with child welfare social workers, who are highly professional, ethical, and compassionate. Perhaps things are different in New York, but the portrayal of the child welfare system is completely opposite of my experience here in Virginia. The episode implies that we social workers need the police to teach us compassion and ethics. While I have to admit I love this show, and watch it every week, I am always angered by the way that social workers and mental health providers are portrayed–it seems that they are always either abusing their clients in some way, or they are just completely incompetent. I watched the episode of Law and Order and felt it was a really well done episode. I wondered if it was based on a true story as I have heard about situations similar to the one depicted in the episode. I know of many agencies where the Social Workers are handed impossible case loads. I didn’t feel it was fair to charge the child protection case worker as it sounded to me like his supervisor and administrators in the agency were more to blame for the situation. He clearly had an enormous case load and he had been forced to lie in the case notes he filled out. I feel that changes needed to be made at Child Protective Services and that punishing one or two people was not going to cause the agency as a whole to change. The episode also showed several issues at the society level that needed to be addressed. Parents need support in raising their kids especially when the child is acting out as we are all human and parents can become over loaded with the stress of raising children. Also society as a whole needs to look at better ways of addressing drug addiction and mental illness. People with these problems are often stigmatized by society and they are not provided with the support and treatment they need to change, grow, and recover. I disagree that the episode portrayed social workers and mental health workers in an unfavorable light. In fact, the direct care worker was shown to have done everything in his power to achieve impossible expectations for performance, given his case load. 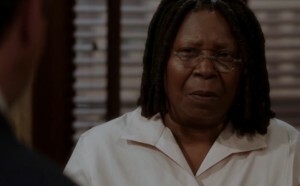 Whoopi Goldberg’s character had a psychotic breakdown in court, due to the stresses and probably secondary victimization/PTSD brought on by dealing with horrible and pathetic situations afflicting innocent children as well as trying to administrate and supervise with totally inadequate resources. Sure, the police initially came across as judgmental, but I believe the show could be a wake-up call for people who believe that child care workers are at fault when a child in their care suffers.